A polite, conversational turn of phrase for most people, but for Dr. Tami, the question of “how are you?” is her life’s work. Dr. Tami really wants to know how you are both mentally and physically. And remember, “fine” is a four letter word! Are you living a life of energy, balance, and vibrancy or do you feel like life is a never ending hamster wheel of stress, overwhelm, and exhaustion? Do you feel like you’ve been dismissed by your doctor, been told that it’s all in your head, or worse yet, that “you are fine”. THE ABSENCE OF DISEASE DOES NOT EQUAL WELLNESS. In other words, just because traditional medicine can’t find something amiss, it doesn’t mean that there isn’t something wrong. This is not how we should feel about health care, self-care, and well care. Being seen, being heard, and being validated are the foundation on which Dr. Tami has built her practice. Really listening to her patients and clients has enabled her to distill years of research and experience into doable and actionable steps that make it easy for her clients to get results, often when other things have failed. Dr. Tami gave me her undivided attention and listened carefully to the “music” not just the words. She recognized that I could have some significant underlying medical problems which would be difficult for the average medical doctor to diagnose. Because she is highly trained in hormones and metabolic physiology, she knew exactly what to look for. A simple blood draw gave her the information she needed to proceed with prescribing natural hormone creams to treat my deficiencies. I am a fairly educated consumer when it comes to health care and am not easily impressed by physicians, having had some difficult health issues in the past. I did not hold much hope for the hormones to really produce much benefit to me…..nothing could have been further from the truth. I was astounded by the complete reversal of my symptoms in about 6 to 9 months. I am a new person, in every way. I look, feel and perform like I did a decade ago and I owe it all to a very astute, Dr. Tami! She has been blessed to live in a family where caring was simply a way of life. From her mom baking homemade bread for the entire street (a tradition she and her daughters now enjoy) to her father making sure that funds were available for her to take ballet lessons, her brothers to play hockey, and all of them taking piano lessons; her life has been full of rich and joyous examples of caring, commitment, and love. Values that she is now passing on to her 2 daughters and is exemplified in the work she does day in and day out as a passionate and dedicated advocate for women’s health. After an illustrious career in the ballet, she discovered that she had a great talent for chemistry; combining that with her intense desire to make a difference and a career in medicine was launched. and she is on a mission to change that. You absolutely can live life fully with abundant energy, vibrancy, and enjoyment of everything you love. It is possible and Dr. Tami’s proprietary processes enable you to do it more easily and with faster results that you ever thought possible. Tami Meraglia, M.D. is a physician with a passion: to help women take charge of their own hormone health and happiness. Her unique voice is sorely needed today as women face hormone imbalances and deficiencies before, during, and after menopause. These conditions, which can assault quality of life, are nothing new. hat is new is that they are appearing earlier than ever before, and at a time when women are already stretched to the limit. And women are often misdiagnosed by the medical establishment. As a busy mom of 2 daughters, a doctor with a thriving practice, Founder of the Vitality MediSpa and Medical Clinic, and a best-selling author and speaker; Dr. Tami knows that you often have to make choices over things like cleaning the juicer or getting your kids out the door in the morning (she also knows which one you’ll choose!). Life is hectic and busy, but that doesn’t mean that you have to come last in the equation. Effortless weight loss, abundant energy, optimal brain functioning, and peaceful rejuvenating sleep are not unattainable goals; you simply need someone to guide and show you the way. You can’t erase life, but Dr. Tami can show you how you can rewrite your story of living more healthfully, joyfully, and fully each and every day. 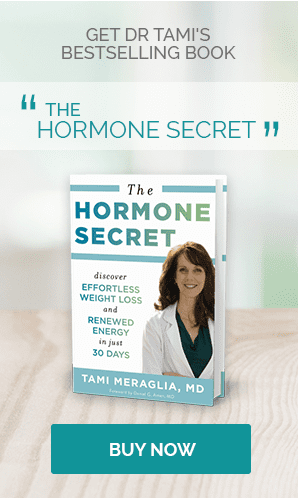 If you haven’t already, please take the complimentary Hormone Quiz and get your Personal Secret Hormone Handbook in order to find out how your hormones may be keeping you from enjoying life to the fullest.